When I moved from Italy to the States I had several adjustments to make to my behavior and habits in order to fit in nicely with the American society machine. Certainly one of the adjustments was driving. I had to stop driving like an Italian and start driving like an American. Driving in Italy is very challenging and risky business. Italians are in general good drivers but also very aggressive drivers and it is intimidating if you are not used to it. The street code in the States is very similar to the Italian one, except for a few details; everything looks familiar and you feel confident until you find that one signal or driving behavior that is different and usually surprises you when you really need to know what’s going on. Eventually I figured out that in the States (or at least in this state) it is legal to do so but it took a while to get used to it. In Italy people commonly blow red lights, but that is one of these classic common illegal things people do. An easy adjustment was parking. 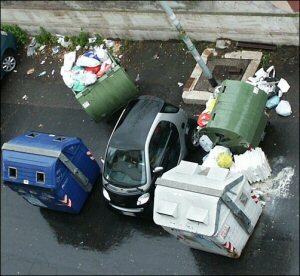 Parking anywhere in Italy is, to say the least, challenging. For example, be ready to walk! There is no way you will ever find a parking spot within 500 feet of whatever location you need to go. You need to park wherever you can and then walk to your final destination. That’s the only way of avoiding going around all day long looking for a space for your car. Depending on the area it is often a lot easier to walk a mile or two than to park next to your destination. That’s why Italians walk so much and are so skinny! Parallel parking on the side of a busy street is also by far the most common way you will ever park in Italy. Be prepared to have only a couple of inches of space in font and back of your car for your parallel parking challenge. You eventually get used to it; in fact, when I took my driving test in the States, I scored 99 points out of 100 points. At the time of the test I had being driving for 10 years and I was proud to be a decent driver. That one point taken away burnt my ego. I asked the instructor why I didn’t get a full 100. He told me that he had to take away one point because in the parallel parking test I parked too close to the car in front of me. I told him that in Italy if I ever left more than a few inches of space between cars I would get a ticket for wasting too much precious parking space. We laughed. It is so insane that driving is now probably the biggest “cultural” shock I get when I go back to Italy. I am not used to it anymore. I am now used to the slow and polite average American driver. Kind of boring, but at least you don’t risk your life everyday. Another interesting thing to mention is the types of cars that Italians drive. Things are changing, but until a few years ago high gasoline prices, relatively short distances and a good railway system contributed to push the average Italian to buy very small cars. 1.6 liters were considered medium-large vehicles. 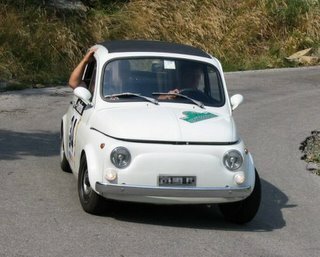 As a student I used to drive a 0.9 liters and you are probably familiar with the ever popular “Fiat 500” (in the photo above), which is a 0.5 liters car. Very few people ever considered buying an SUV, a Van or a Track; impossible to park, too big for the roads and too expensive to maintain. Today, I am told, things are changing and SUVs and Hammers are a reality even on Italian streets. Also, 99.9% of cars have manual transmission. I never drove a car with automatic transmission while I was living over there and I had no clue what “automatic” really even was. I guess one of the reasons is that we don’t have drive-through fast food restaurants and we are not allowed to talk on the phone or eat while driving a car. You won’t even find cup holders in Italian cars. No need for that free hand while driving! Manual transmission is just fine. Another interesting aspect of driving in Italy is the way the Italian government deals with pollution. Here in the States when the quality of the air goes bad they issue a warning and they politely ask you to try to carpool or take public transportation. In major cities in Italy when the quality of the air goes bad, the traffic gets blocked! That is you *cannot* drive for the day. They put road blocks and only a very few with special permits (like Cabs and Buses) can pass the blocks. Everybody else has to stay home, walk or take public transportation (if there isn’t some kind of strike going on…). Good for the economy? No! Good for the air quality? Sure! Since this traffic blocks, as mentioned, are bad for the economy, the Italian government solves the issue of both pollution and economy with one brilliant move! They force you to change car! Matter of fact from 2006 all cars are categorized based on their pollution ratings. Then they decided that some of the higher polluting categories cannot be on the roads anymore. That is if you have a car that is too old, they kick you out of the roads! You have to trash it and buy a new and less polluting one. The alternative is to make heavy modifications of what you have, that usually cost more than a new car. Good for the economy? Yep! Good for your pockets? NO! Fun animation: Italians vs. Europeans.